A big update was released for the Survive ARK Companion app (Android, iOS). The update includes a lot of new features, including a dark theme, dino harvesting & drops and information regarding the new Scorched Earth DLC. To make it easier to see what’s exactly been added to the app, I’ve decided to create an image that shows the most important changes (which you can find at the top). For the exact changes, you can check out the patch notes. 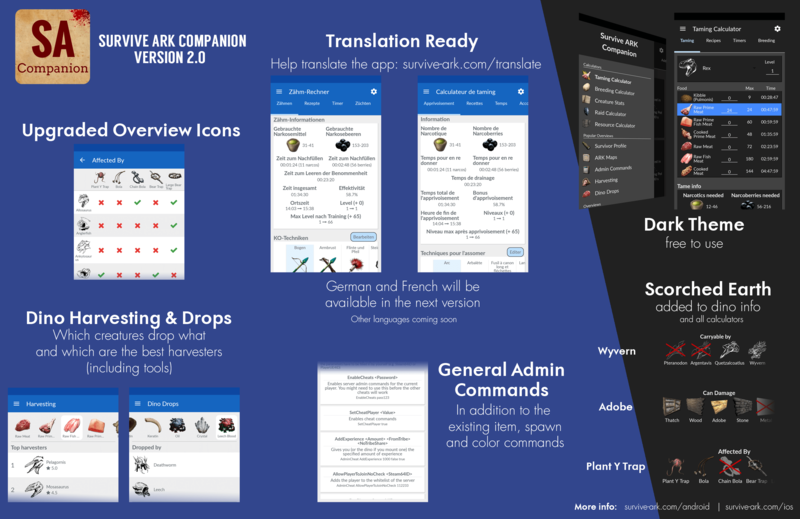 Of course the companion app will be updated with even more features. To give a small update, these are some of the features I’m currently working on and will be added to the app in one of the upcoming updates! A lot of the above features have been suggested by the users of the app. In case you know anything that you want to have added and it isn’t on the list yet, don’t hesitate to contact me about it!